Dubai Hills Park, the emirate's new central oasis which celebrates community living with rich lifestyle choices, is set to welcome the first residents in early 2019. It boasts key amenities including a 2.5-km jogging park, skate park, café pavilion, the UAE’s first man-made beach-in-a-park, splash park, weekend markets and a dog park. Only 15 minutes from Downtown Dubai, the meticulously-designed Dubai Hills Park has become one of the most beautiful outdoor destinations in Dubai Hills Estate. Dubai Hills Park has a size of roughly 180,000 sq m – four times the size of Place de l'Étoile in Paris. Residents of Dubai Hills Estate will be assured a relaxing getaway just minutes away from their home and the Dubai Hills Mall with over 650 retail, entertainment and dining outlets. 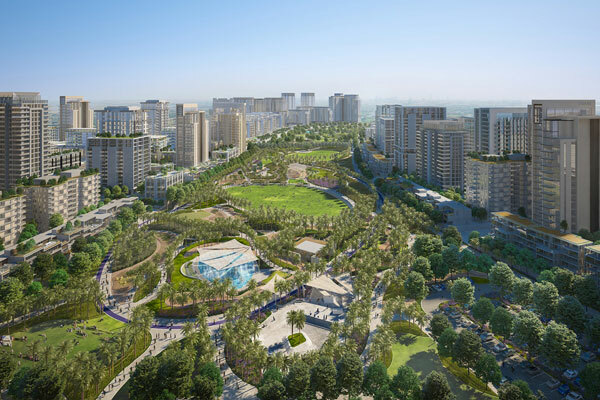 The park will further improve their quality of living with its assortment of activities that promote wellness and a healthy outdoor lifestyle, said a statement from Dubai Hills Estate, a joint venture between leading developers Meraas and Emaar. Located at the crossroads of Al Khail and Umm Suqeim Roads, Dubai Hills Estate is one of the largest master-planned communities in the city offering breathtaking views of the iconic Dubai skyline, in addition to Dubai Hills Park, mall, golf course and other lifestyle amenities. Several residential projects are available for investors, with a projected strong return on investment. Tenants, on the other hand, will benefit from a laidback lifestyle in the heart of the city. According to the Royal Institution of Chartered Surveyors (RICS) in London, apartments next to or very near to a public park are proven to sell for as much as 19 per cent more than the same type of property in another location. This further positions Dubai Hills Estate as a prime investment opportunity. As a sheltered, green oasis that celebrates community life, Dubai Hills Park will be a vibrant new outdoor lifestyle hub delighting residents of Dubai Hills Estate and their guests. There is a strong positive correlation between green spaces and improved levels of mental health. The University of Exeter’s Medical School has proven a long-term positive impact that frequent visits to parks and gardens can have on urbanites, said the statement from Dubai Hills Estate. Drawing on the local culture and the region’s natural landscape, Dubai Hills Park will have many exceptional and innovative features including an urban beach and splash park, skate park, 2.5 km jogging park, a café pavilion, and a dog park, to name a few. Weekend markets will promote community engagement and local enterprise, it stated. "The UAE’s first beach-in-a-park has a sandy shored pool, a state-of-the-art splash pad, and a picnic area for families to relax while children play. Visitors to Dubai Hills Park can run, cycle, play, take a walk through the park’s lush landscape, or just kick back and relax in the open spaces, said a company spokesman.